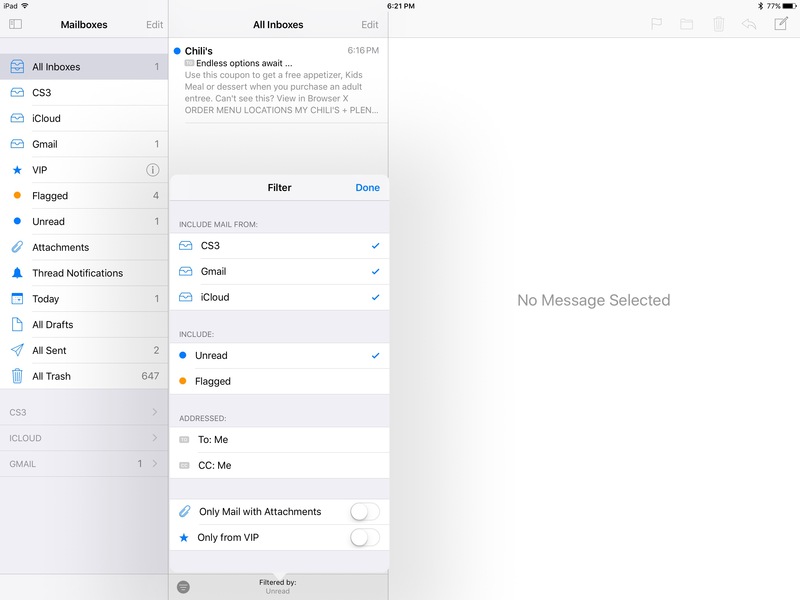 Despite iOS Mail showing its age as the years saw few changes or improvements, it took some time before competitors were able to make significant inroads on iOS. There has been a stand-alone Gmail app since 2011, but the early versions were very disappointing, and didn’t hold a candle to the Android version. I briefly used this app, but it just wasn’t good enough or stable enough to supplant Mail. Google didn’t release a version truly worthy of the Gmail name and reputation until a few years later, which was too late for me. By that time, I had jumped on the Mailbox bandwagon. 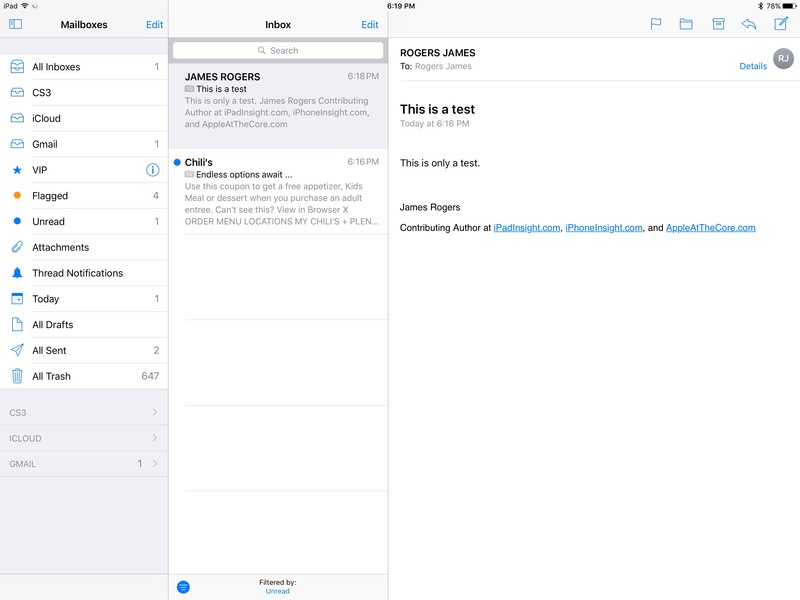 Mailbox was the first third party email that gained a spot on the Docks of my iPad and iPhone. Since it only worked with Gmail early on, and I use Exchange for email at work, it was never a complete replacement for Mail. However, lack of Exchange support was the ONLY reason it didn’t become my sole email app. 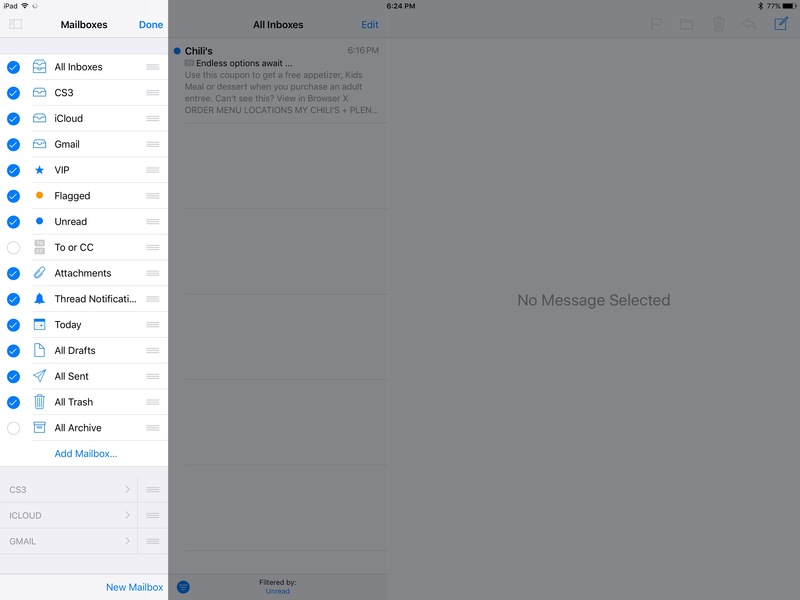 Mailbox was notable for bringing the Schedule feature that is now very common to iOS, and also added the pull down to refresh feature that every app seems to have copied. This app seemed to be headed to the top until Dropbox swooped in and snapped the company up in March of 2013. After a couple of years of business as usual, development slowed down and Dropbox eventually pulled the plug on the email service and app. Its features live on in many other apps, but Mailbox’s end is unfortunately a common tale in the App Store. When a larger company acquires and app and its development team, they often have different designs in mind than the app’s original purpose. Unfortunately, it is all too common for users to get left out in the cold in these “aqui-hires.” Apple’s purchase of Siri, which was once a successful stand-alone voice search app, is another prime example. The next app that I ended up moving all of my email accounts to is an example of the opposite situation. In 2015, Microsoft purchased the popular email app Acompli, to the chagrin of many loyal users. However, instead of killing it, they simply rebranded the app as Outlook for iOS, and then put significant time and money into improving it and adding new features. Microsoft also purchased the popular calendar app Sunrise, and integrated it into Outlook, turning it into a full Personal Information Management app. I already have a preferred Calendar and Task app in Pocket Informant from Fanatic Software, so that part of Outlook never interested me. However, the mail features were exactly what I was looking for at the time. 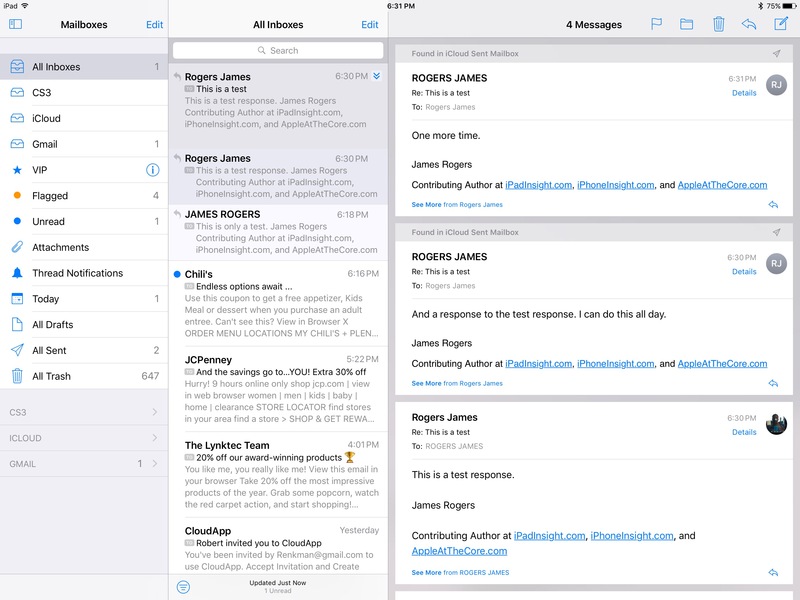 Outlook took the best features from apps like Mailbox, with scheduling, customizable swipes, and pull to refresh. However, the best part was that, where Mailbox was limited to Gmail for a significant portion of its life, Outlook worked with every email service imaginable. It was capable of being a full iOS email replacement, and it served in that role for me for a couple of years. Just like with the Notes app, I made note of recent upgrades from Apple as they were announced. However, I still rarely used the app after the release of iOS 10. What got me to take a hard second look at Mail was a run of issues that I experienced with Outlook. I started having some problems with lockups and crashes in the app over a month, which went from an annoyance to a legitimate hinderance to use. I manage the majority of my work email on my iPhone and iPad, so this was not something I could just overlook. I also had a LOT of problems with the Watch version of the app over an even longer period, which I had used extensively to triage and delete incoming emails without having to get my iPhone out. The last straw for Outlook, at least as my primary email app, was when it failed to show some standard forwarded content that I needed in an important email. The sender sent me this particular email two or three times, even trying different email accounts, but nothing worked. Then I opened the same email in iOS Mail, and I noticed that the content I needed was shown properly. It wasn’t the sender or my account’s fault. It was my app’s fault. After over a month of problems, this was the last straw. 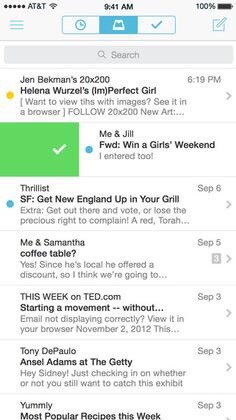 When it comes to work email, failure isn’t an option, so cool features and a nice app design only go so far. If one thing can be said for past versions of iOS Mail, they were reliable. However, when I dug deeper, I found that there were actually features and improvements that I hadn’t used that made it much better and easier to use than in the past. The first feature was actually an existing one that I had actually used before, and for the life of me, I can’t understand why Microsoft never added it to Outlook. The ability to swipe an email draft that you are working on down and out of the way, and go look up additional information in other emails is a no-brainer. 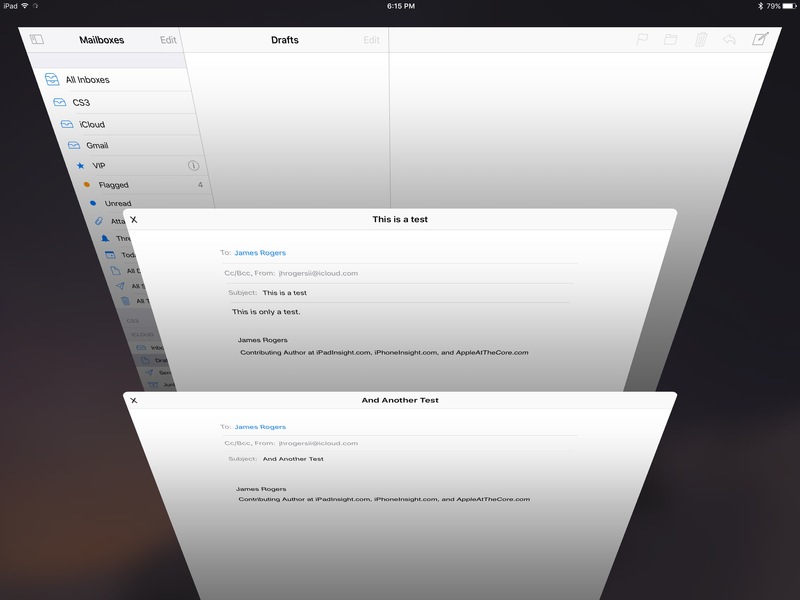 In fact, you can have multiple drafts open at once and move between them using this feature. For whatever reason, neither Outlook, Gmail, or Google’s other email app Inbox have this incredibly handy feature. There were a actually few times I used iOS Mail to compose a message after I had switched to Outlook because I knew I would need this feature. Now that I am using Mail again, I find that I use this often with it always in front of me. The next upgrade to Mail that I am finding very helpful is the enhanced filtering features that have been added. This used to be a weakness of the app in the past, but Apple turned it into a strength in iOS 10. Now there is a filter button in the bottom-left corner than can be set up and adjusted however you prefer. I keep mine set up to show unread email by default, but by tapping the blue text under “Filtered By” at the bottom-middle of the screen, you are taken to a setup menu where the behavior of the filter button can be altered. You can see here that the setup is very flexible, with options to include or remove any email account, unread emails, flagged emails, how the email is addressed, attachments, or your email VIPs. Whatever changes you make are saved, so they can be reused until adjusted again. Having one-touch access to your preferred filtering is a VERY welcomed addition, and actually beats out Outlook’s email filtering, which is less flexible, and takes two taps to enable. Apple also added quick links to several different filtering categories that can be enabled and added to the main email navigation menu. These links give you access to common items, such as flagged or unread emails, emails with attachments, emails from today, drafts, all sent messages, all trash, and others. Unfortunately, users have to know to tap the Edit button at the top of the navigation menu to turn these links on, which isn’t exactly intuitive. I remember hearing about these new features when iOS 10 was announced at WWDC 2016, but by the time I started using Mail again, I had forgotten about them. I happened upon them days later while re-organizing the order of my email accounts in the navigation menu. There they all were, sitting idle since they are disabled by default. If a guy who writes about iOS has to go hunting for a feature, you can bet many users will never know about it. Whether it’s a quick intro video or having them turned on instead of off by default, Apple needs to make this handy feature more prominent. Another feature that Apple is beginning to roll out across its native apps is AI enhancement. In some cases, it is Siri recognizing forms and fields and giving you one-touch selection capability from the keyboard. In the case of Mail, it is mostly related to recognizing emails from contacts, and finding differences between the information in their emails, and what you have in Contacts. This is a small start, but hopefully it’s also a harbinger of good things to come. Apple has made plenty of statements about their recently expanded work on Siri and AI that can both search your data and take actions, but also preserve your privacy. Apple has a lot of our information, and since most of their searching is happening on-device, they actually can have access to much more that isn’t in iCloud. They also know good an well that they are playing catchup to EVERYONE at this point, so they can’t sit on this. The AI features in Mail absolutely have to be expanded in iOS 11, but everyone has to start somewhere. I would be more critical if Apple had been more ambitious and had added something less reliable. Starting small with something that works well is a smarter move. Another addition to Mail in iOS 10 is message threading. Here is another feature that pretty much all of the competition has added over the last few years. It’s good that Apple has FINALLY gotten its act together and put this feature in iOS Mail. One handy feature of the app’s threading capability is that it can be disabled for those who don’t prefer it. Users can also determine how messages are ordered, and if emails from other folders appear within threads. As many back and forth project emails as I receive for work, this feature is a must for me. I need to be able to see both the ones I’ve recieved and my responses in chronological order. It’s good to see Apple finally catching up in this department. Another subtle addition to Mail that shows up on the iPad Pro is the ability to move to a three window design, with the navigation menu anchored at the left. Below you see Mail with the nav menu hidden. And above you see it anchored. This allows you to easily switch between folders and accounts with fewer taps. It is a smart use of the extra screen space on the iPad Pro that I find very useful. Conversely, this is another feature that Microsoft has chosen to not adopt in Outlook. Its nav menu comes in from the left, but disappears as soon as you make a selection. 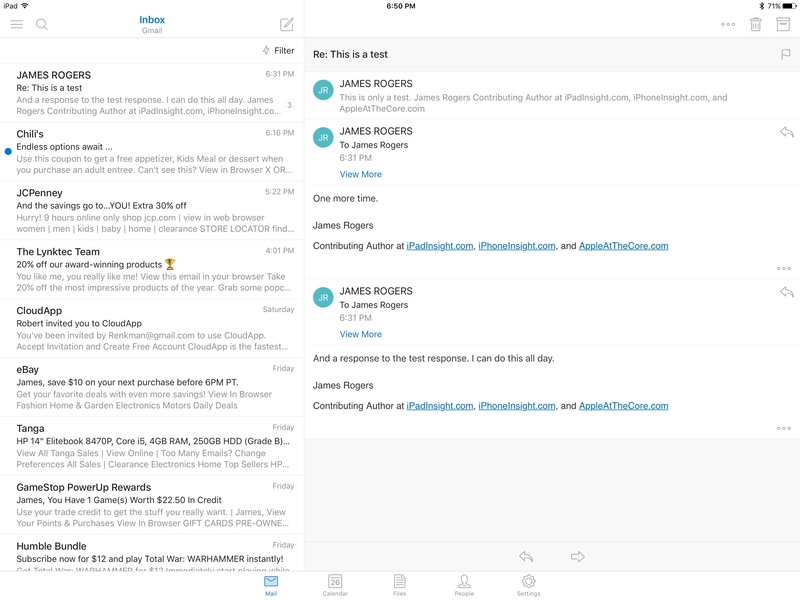 While I am largely satisfied with the experience of going back to Mail as my primary email app on my iPhone and iPad, there are still a couple of issues that keep me from being completely satisfied. 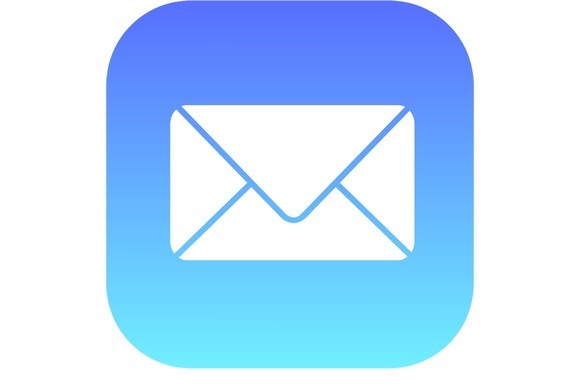 First off, even though Mailbox showed the way on Scheduled email over four years ago, and pretty much everyone else has adopted the feature since, Apple has stood fast and has refrained from adding it directly to Mail. I realize that I can use Siri to trigger a Reminder for an email, which is at least something. However, the only way to do this is to use my voice with Siri. That isn’t always ideal, especially in a work environment. Even if Apple just added a Share Sheet icon to the Email viewer where a Reminder can be added manually, it would fill the gap pretty effectively, assuming Apple let’s users know the feature is there. However, until that time, Microsoft and Google still have a leg up in this department. When I have to Schedule an email for later, I usually fall back to Outlook, which I still have installed. I am hoping this is addressed in iOS 11, so I can go with Mail exclusively in the future. The other drawback with Mail actually has to do with my use on Apple Watch. While I appreciate the full feature set that Mail offers on the Watch, including the capability to respond to messages, triaging incoming email is actually more difficult than with Outlook. All I want to see with notifications on my Watch is the subject, sender’s address, and maybe a brief snippet of the message. If I want to read it and resond, I will usually open it on my phone. My preferred notification setup is what I get with the Outlook Watch app, followed by options to Schedule, Mark as Read, and Delete the message. With Mail, I have to scroll the length of the message to Delete from the notification. It is generally faster to tap on the notification to open the email in Mail, Force Touch to bring up the options, and then tap Delete. This is a small thing, but for people like me who get a lot of email that can be scanned and deleted quickly, the extra taps and scrolling are tedious and add time to a process that should be smoother. Unfortunately, the only option for notifications for Outlook on the Watch is to mirror what’s on the iPhone. I don’t want duplicate notifications on my phone, so I am just putting up with the notifications served up by Mail for the time being. Again, it isn’t the end of the world, but this is something I hope Apple will address in watchOS 4. Another update that I would like to see that would rival some of the actionable notification features we see on Android would be the ability to make quick email responses from within a notification. 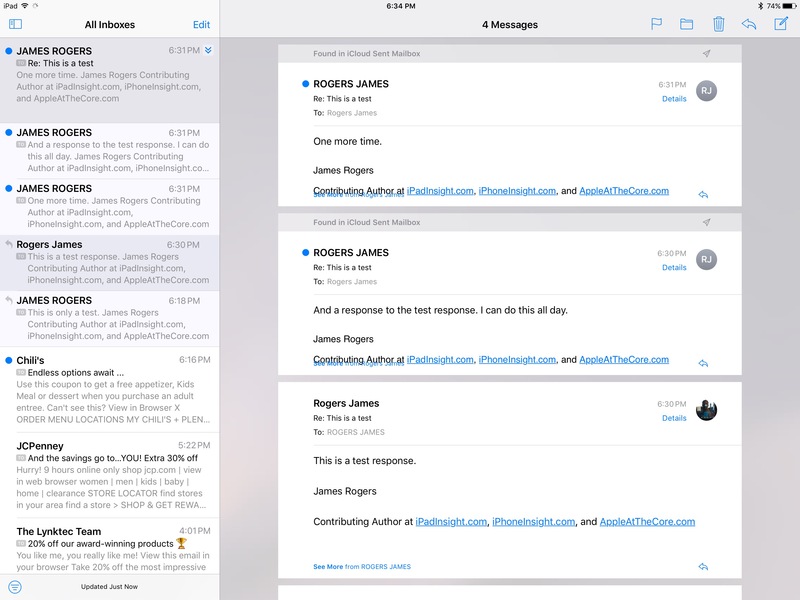 We already have this capability in Messages, and also inside the Mail app on Apple Watch. The ability to make quick replies would even out the feature set in iOS, and save some time for those of us who need this often. I took a look at my path going back to the iOS Notes app first a couple of weeks ago, because I feel that it has seen the most positive changes of any iOS app over its lifetime. However, I think Mail is right there with Safari, battling for second place among the other native apps. Multiple filtering additions, the beginnings of AI assistance, flexible message threading threading, and the three pane layout option on the iPad Pro are all significant updates that make the app both faster and easier to use. Hopefully Apple will add enhanced message scheduling, the ability to respond to messages within notifications on the iPhone and iPad, and easier notification triage options on Apple Watch in iOS 11. 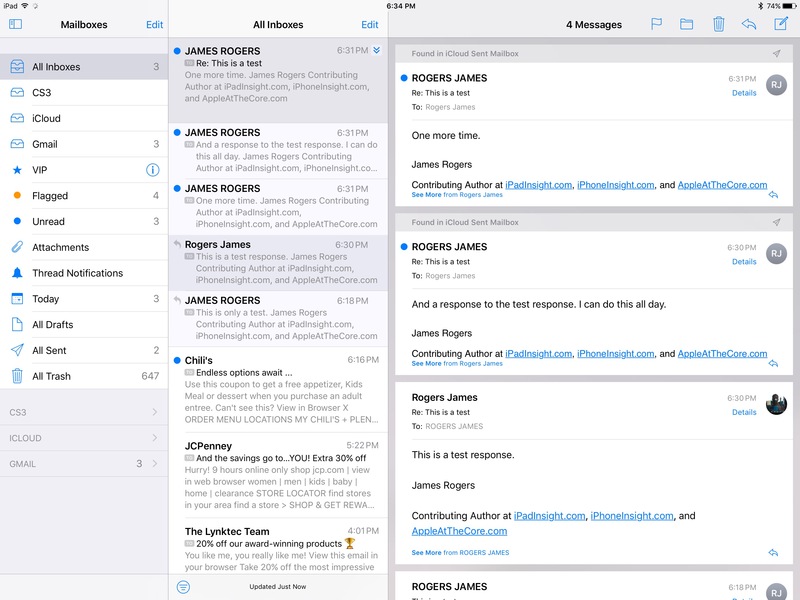 Until then, despite the fact that it isn’t perfect, Mail is the best app for me right now. Hopefully Apple will make the necessary changes to stay ahead of the competition going forward. I am curious to hear the experiences of others with Mail recently. Is anyone else out there using Mail over other offerings like Outlook or Gmail? Has anyone left another product and come back to Mail, like myself? If so, let me know in the comments, or feel free to respond on Twitter @iPadInsight or @jhrogersii. Hop looks interesting. My biggest hangup is the lack of a Watch app. I’ve been trying to stick with apps that exist on the iPhone, iPad, and Watch. Inbox is my primary client of choice. I used to use Mailbox, and I do use Outlook for work email. But for everything else, it’s Inbox. For a couple of reasons. 1) The ability to defer Email. It’s essential, IMO. I use that all the time. Outlook does it too, but I need more than just this. 2) The ability to keep your Todo’s mixed in with your email. I like the workflow there. These can be deferred as well. 3) The ability to lump links in – short links that I want to save to look at later when I’m on my desktop, I can save them to Inbox, and they’re there with my todo and my email. The combination of these three are what keep me with Inbox. If the native app ever added these things, I might look at going back, but I doubt they will. Yeah, I wouldn’t expect Apple to add features like that to the native mail client. When you think about it, neither did Google. They have incorporated pieces of Inbox into Gmail. But I don’t think they will ever go all the way because people like me might be hesitant to adopt such a foreign workflow. There is really no way that mine would fit effectively into Inbox. I’ve dabbled with it, but it just isn’t for me. But this is exactly why there are many different email apps available for multiple platforms. Different needs demand different features and design elements. MY biggest problem with Apple Mail is the way it handles deleting messages. When you delete a message, it doesn’t go back to the list, but opens (and marks read) the next unread! So, when deleting email in native iOS email, my “flow” is read, go back to the list, swipe to delete (instead of just hitting the delete button). I’m right there with you, Max. I use Gmail for my personal email and would love to see those features, as well. I switched to spark a few months ago and haven’t looked back. I love it. A guy on the Flipboard comments mentioned Spark, as well. I tried it over a year ago because it had an early Apple Watch app, but at the time it still didn’t have Exchange support. I see that it does now, so I think I may give it another go and see how it stacks up. I have never left Apple Mail. Even when I moved to Android for a while I still used Mail on iPad. GREAT REVIEW!! I too have been using outlook for ios which I like for a multitude of reasons; i love the scheduling feature, but mostly I like the attachment feature, where all attachements are listed separately for easy access, to review or send to someone else. Additionally, the feature to open a contact, and review attachements from that contact is a great feature. However, like you, I have experienced some issues lately, such as failure to send an email with an attachment, lock-ing up, and some other issues. I had recently switched over to BOXER email, which I found excellent, and it allowed to add a logo within your email signature, which Outlook doesnt allow. Recently, I was playing with the iOS naive mail app, and was pleasantly surprised that they now allow pasting of a logo of photo within the email signature field, which is a big plus for me, so I started playing around with it, and I also discovered it now supports adding attachments ffrom dropbox and other third party apps into emails! There are still some other options I would like to see added, such as direct intergration with calendar apps, but it has been vastly improved, so I will give it a try for a while! !